Home > Heavy Duty V Belts > V-Belts. A, B, and C Sections. Standard and Kelvar Construction > A-Section (Classcial) V-belts. 1/2" Wide > A42-KC Ultrapower V Belt. Kevlar Wrap A42 Industrial V-Belt. 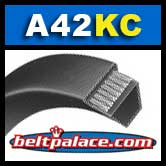 A42-KC Ultrapower V Belt. Kevlar Wrap A42 Industrial V-Belt. 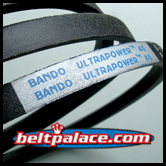 A42KC BANDO ULTRAPOWER AG Belt. Kevlar Wrap A42 Industrial V-Belt. A Section = 1/2” Wide, 44” Length OC (1118mm). Features superior “clutching” Kevlar/Aramid fiber cover for high durability and extra long service life. Heat and oil resistant. NAPA-Sunbelt, Grainger, Ametric (low grade) A42K. Table Saw Belt, Delta Part # 49-034. Sears substitute for 400-06-133-0001 and 643928. 4L440 FHP V-Belt. Industrial Grade. 4L440 FHP V-Belt. 1/2” W x 44" Overall Length. Industrial Grade.